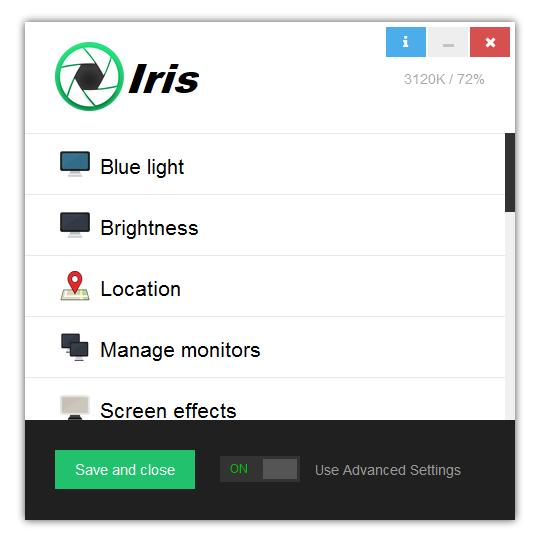 How Iris reduces Blue light? Monitors emit all colors of the rainbow, but they don’t emit full spectrum sunlight which is bad. Everyone agrees that staying outside on a sunny day helps our health, but this is not the case when we sit in front of the computer. Monitors today are made from semiconductors called diodes which contain 3 subpixels emitting red, green and blue. When you combine this 3 subpixels you get 1 pixel and if all 3 subpixels are ON we see white on the screen. If all are OFF we see black on the screen. When we zoom our monitor we get patterns like this. If you have Iris working on your system you will probably not see the blue subpixel so one way to see what I talk about is to pause Iris for a moment. The screen will start to glow a lot and you will be able to see the blue subpixel. What’s the problem blue light? Scientist knew that the retina contains two types of photoreceptors – rods and cones. Thanks to them we see light and images in full color. But in 1998 one scientist named Ignacio Provencio found a new photoreceptor called Melanopsin. 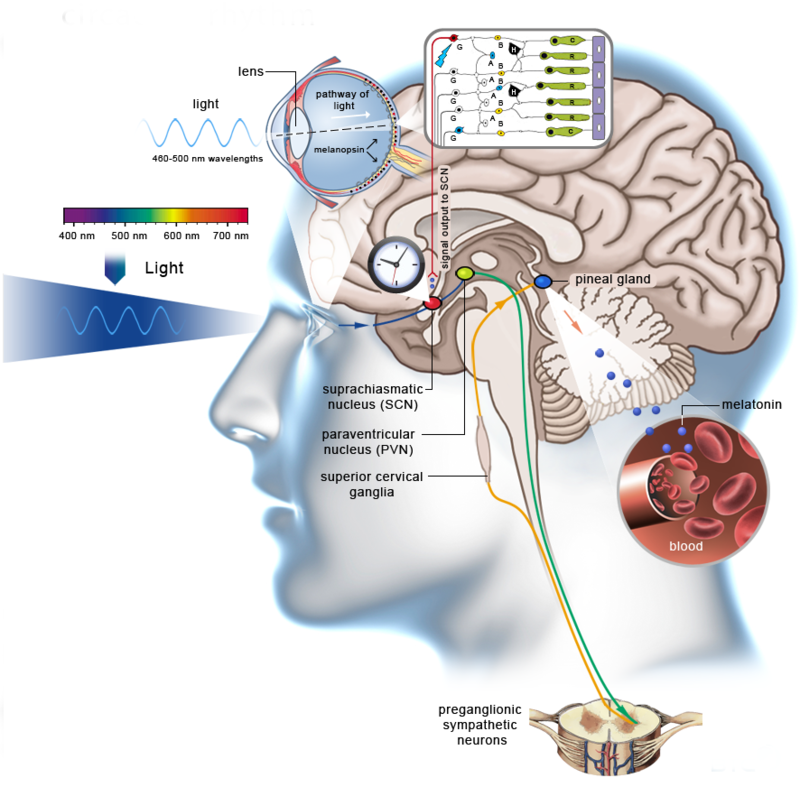 Melanopsin evolved millions of years ago to help early human distinguish between day and night and to regulate their circadian rhythms or in short to help our brain tell our body when to sleep. This was normal when we only had light from candles and campfire, but lately, we are bombarded with all kinds of electronic devices and especially devices containing LED diodes. This photoreceptor Melanopsin activates when blue light goes into eyes. The idea of nature was that if the sky is blue then it’s day and it’s no time to sleep. However today the same kind of blue light is emitted from our monitors and we just can’t go to sleep at night, because our Melanopsin photoreceptors are overstimulated and our Melatonin secretion is stopped, because of this. To fix this problem and to help you to fall asleep faster Iris is gradually decreasing blue light at night. This helps your body to produce more melatonin and your melanopsin photoreceptors and not overstimulated. Reducing blue light is also beneficial during the day since blue light is the light with shortest wavelength and it enters really deep into the eyes. Iris reduces the blue light by lowering the light emitted from the blue subpixel of the screen. The orange, yellow or red color of the screen is just a side effect of this blue light lowering. It will probably take you some time to get used to this, but after a week you will not be able to disable Iris at night without feeling a massive amount of eye pain.